Welcome to our website "Work & Beauty" Border Collie Kennels. I am Elisa Marco, a breeder and a lover of the Border Collie, definitely the centre of my life and I hope yours too! For us it is very important to achieve a balanced dog, that has a nice appearance without forgetting the breeds instinct of work and herding. Our goals is to breed dogs that are good at various sports and activities, and also suitable for owners to enjoy this wonderul breed. At Work & Beauty our border collie puppies are raised in a family setting, with all our love and attention. With our experience in breeding and aided by our veterinary team, our puppies enjoy and grow in a healthy environment, socialising with other components of the Kennel, children, family and friends. Our Kennel is located in the middle of a large natural area surrounded by pine trees, where our dogs have space inside the kennel complex and outside it. Outside we practice our hobbies, such as walking on the mountain, mushing with a mountain bike, and be able to go for long walks without crossing populated areas. 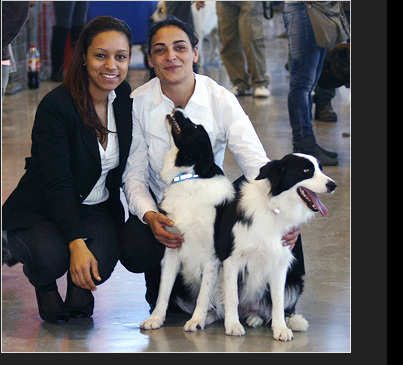 We are passionate about our dog standards and attend many dog shows in Spain, and have won many awards. Dogs shows are just part of our interests. Being a breeder of Border Collies is part of our life, we also enjoy the company and love the thrill of seeing our adult dogs exploring the natural environment, running and interacting with us. It is something that ewen a breeder and an owner of this wonderful dog must never forget! Our adults have individual enclosures with huts and protection from the elements. Each enclosure has space and the enclosures are normally open with the dogs allowed to run free. They have access to our farm house with us, but always have a space they can call their own. Our small puppies are born inside our family home, very close to my room, I prepare the space with everything they need, and we remain together until they reach the time to move to the puppy kennels outside,In the wild, a mother would diig a secluded den to have there her pups which is what I replicate in my home as much as possible. Away from noise and bright sunlight is most important for the first weeks of life. I prepare the area for the pregnant mother with great care, and she sleeps with me on my bed. When she gives birth, I stay with her and help with the birth right through the entire process. In some cases it can take all day and night, but these ealry stages are crucial to the health and safety of the new born puppies. The mother has complete trust in me, and we have a strong bond during the birth and right through the first weeks of life for the puppies. After a few days the puppies open their eyes and slowly become more aware of their surroundings. After this period is complete, I move the puppies to a larger area for them to develop and strengthened and begin their first races and games with each other. At roughly 4 week I can begin socialization with other components in the kennels, the adult dogs, close family & children. Our kennels are away from vehicles, bikes, etc... The puppy kindergarten is outside within our farm where they enjoy lclimbing obstacles, hiding under giant toad stools and minature wooden houses - an environment perfectly designed to develop their physical abilities and stimulate their minds. These things are crucial to get a well balance dog used to humans and handling, and that will completly trust their new owners. In this private space which they share with their mother, they grow healthy and receive their first vaccinations, to have a good immunization and prepare to make the introduction into the outside world and their new home. Our puppies are sold from two months of age and are dewormed internally and externally, all their shots incluyding rabies, microchip, European passport... and proof of their pedigree. For more information find us on the web at facebook, email or phone, I will be happy to assist you.